As part of its Xbox Live service, Microsoft promised to introduce more Primetime-oriented features, to help its users socialize more in a game show-style format. For a while there, the company really had something going with its video game adaptation of the hit TV show 1 vs. 100, only to cancel it out of the blue and leave several users bummed in the process. Fortunately, a new social experience is just around the corner, being introduced for the first time this weekend at the Consumer Electronics Show in Las Vegas. 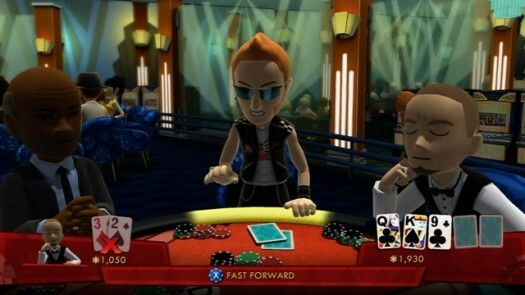 Full House Poker is a game where you play along with others through Xbox Live in full-on Texas Hold ‘Em fashion. True, this isn’t the first Texas Hold ‘Em oriented game to arrive on the service (the free Texas Hold ‘Em Poker game that came out a couple of years ago is still popular), but Full House Poker seems to be the most elaborate game based on the activity to date. The game features a variety of modes to choose from. If you’re limited on time, you can jump into a quick two-player lightning match, raising the ante and seeing who can take all in a matter of minutes. If you’ve got a few more minutes to invest, however, you’ll want to take advantage of the 30-player tournaments that Microsoft will be hosting. Like any given World Series of Poker event, you’ll be able to enter into the lower ranks and, depending on how well you play, bluff your way to the final table and see if you can win the jackpot. AI players will be available as well, but c’mon, isn’t it more fun to take out your aggression on real card sharks? Probably the most important part of the game, however, is Texas Heat. This is a live poker TV show that airs across Xbox Live, put into a 30-minute format similar to 1 vs. 100. Here, a select number of opponents will have half-an-hour to bet and get to the final table, while users take part and watch all the action unfold. No word yet if this tournament will feature actual prizes (like 1 vs. 100 did for some time there), but it wouldn’t be surprising to see Microsoft offer something along the lines of Xbox Live subscriptions or points. Maybe even something more. With Full House Poker, you’ll be able to exhibit your bluffing skills just as effectively as your playing skills. You’ll have a series of unique tells available, which can easily throw off opponents into thinking you’ve got a better – or worse – hand than you actually have. You can also dress up your Avatar in different costumes to throw off your appearance. If you never thought you’d find the opportunity to dress up your virtual character in a cowboy outfit, you’d better think again, pilgrim. We never met a poker face we didn’t like. Best of all, you can take your Full House Poker experience on the go with you. Krome Studios developed a version for the Windows Phone 7 that ties into your Xbox Live account, so anything you earn (or lose) can be carried over into your Xbox 360 status. This is pretty cool, especially if you’re in the middle of a big game tournament that you don’t want to interrupt. Microsoft’s social poker game will hit Xbox Live later in February, as part of the company’s new House Party program (which will also include a new version of Bejeweled Blitz, Uprising: Hard Corps and Beyond Good and Evil HD). We’ll have continued coverage of Full House Poker in the weeks ahead, so you might want to get in your bluffing skills now. Considering the way we play, you will need them.